A side view of the custom crafted 3 bedroom, 3 bath log home. 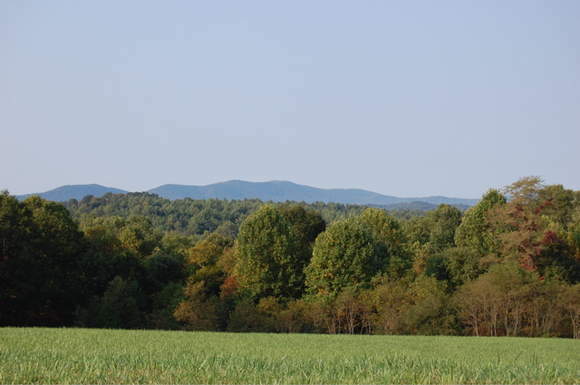 30+/- Acres of rolling land, private with amazing views of the Blue Ridge Mountains. Horse lovers paradise with riding pad, pasture land, barns, outbuildings and a custom built 3 bedroom, 3 bath log home. A view of the rear of the house. This is one of Floyd County's nicer estates. 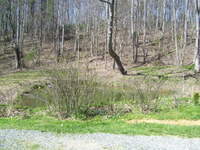 It has 30+/- acres of beautiful rolling land, with a mixture of pasture and woods. A custom crafted log home with three bedrooms, 3 full baths, a full basement. There are two large barns on the property as well as a equipment/hay pole barn. The main level of the home features a large living room with a wood stove, a kitchen with dining area, a large bedroom, full bath and an office that could be used as a fourth bedroom or family room as it is currently being used for. The walls are all natural rustic wood along with all hardwood floors. The second level has two large bedrooms, both with natural wood and hardwood floors with a bath in hallway between the two rooms. There is a full basement with a full bath, game room, study area, office area and a huge laundry room. From the kitchen you can walk out onto the large deck and enjoy the amazing view of the Blue Ridge Mountains. In the front of the home there is a covered front porch perfect for rocking chairs. 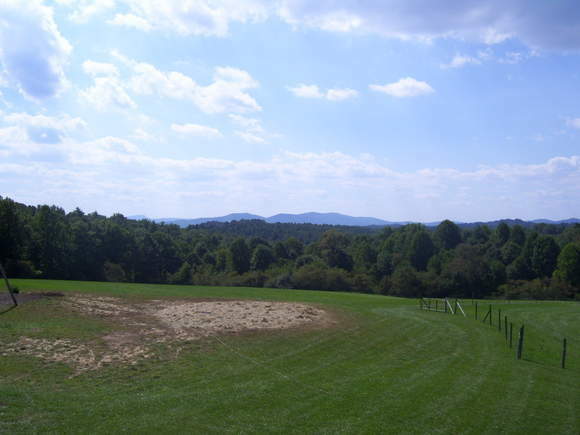 The land is fenced and there is a riding ring just below the house which you have an excellent view of from the rear porch. There is a great horse barn on the property, another large building/barn with tack room and a two bays for vehicles and a third pole barn that makes a great equipment shed or a place for hay storage. Just above the house though one of the manicured gardens is a playhouse for the kids. As you drive down the long gravel driveway to this private mountain home you have a view of the mountains that makes you think you've found heaven on earth. 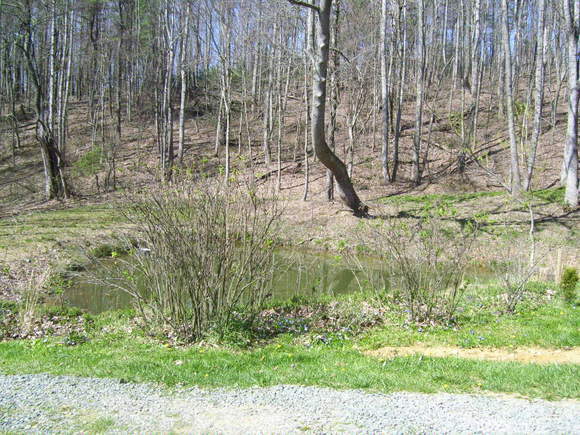 If getting back to nature, privacy and a great place for horses is what you've been looking for, well you need to schedule your appointment today to see this rare Floyd County property. Please call 540-745-6500 to schedule your exclusive, private showing. A beautiful sunset from the property. A look at the riding ring. Another look at the spectacular view. The view as the morning fog rises through the vally below. A view of the surrounding mountains. 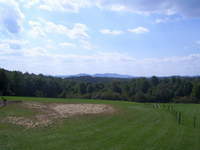 A view of the Blue Ridge Mountains from one of the fields. A photo of looking from the living room toward the dining area. Another photo of the master bedroom. Another look at the master bedroom. There is plenty of room for two beds in the second bedroom. Bedroom number 3 on the main level of the house currently being used as a family room. Another look at bedroom number 3. There are french doors leading from this bedroom onto the deck. The game room in the basement. There is also a office area in the basement. The study area in the basement. A large barn ready for horses. Another barn great for storage with double garage area. An pole barn perfect for storage of farm equiptment or hay. Several flower gardens thoughout the property. A stone path leading though one of the gardens. One of the fields perfect for animals. Another view from one of the pastures.